Our Halibut record is REALLY broken this time! So what is it with fishermen? Why do we always want to catch the biggest fish out there? Especially on the incredible halibut fishing waters of Haida Gwaii. We don’t have the answer to that question but over the years we sure have come to know a few of these fanatical anglers! They are on a perpetual quest, ever hoping to outdo their best catch. Some of these characters become fishing guides and take their quest to the next level – hoping to produce a better result every time they go on the water. 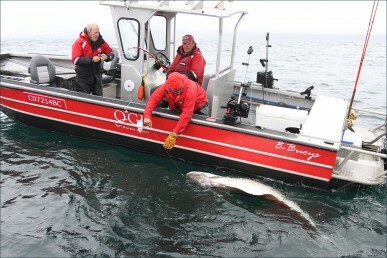 Such is the case with QCL guide Kraig (KoneZone) Coulter, a seasoned professional guide with years of experience fishing in northern Ontario, Alberta and here in Haida Gwaii. And when matched up with guests of a similar mindset, a perfect storm of fishing effort erupts! They are always the first on the water and the last boat in. The weather is not a factor and the sea conditions only make them more determined. On the weekend Kraig was fishing with a couple of fellows from Montana; Bruce Severson and George Best are two great guys that have been up here to see us several times. They’ve shared some fabulous days on the water together. 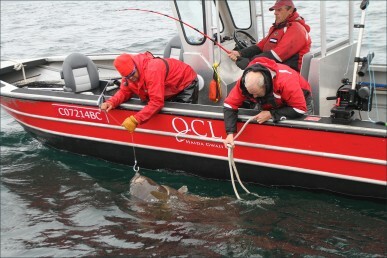 It’s no coincidence that Bruce (and Kraig) landed the largest salmon at QCL last year, a stunning chrome Chinook that taped out to 68 pounds!) Saturday afternoon was blustery, winds out of the northwest at around 15 knots and the air just a little misty. Four kilometers offshore at Kraig’s favourite halibut hole, the sea was rolling slightly with a bit of chop on top. High tide had passed and the ebb was underway. They had dropped down 295 feet on either side of the boat, a traditional jig on one side and a 16/0 circle hook baited with the head of a pink salmon on the other. While Kraig back-trolled to hold the boat in position, Bruce and George bounced the bait just off the bottom. Bruce’s salmon head setup hooked up first, the rod dipping sharply as something far below took hold and tried to take off with it. The take was so strong that he had to rest the grip of the 6-foot heavy action rod on the gunwale of the boat so he didn’t get hauled overboard! Halibut tend to inhale their food, sucking it into their mouth for a taste before actually biting on. The salmon head passed the taste test and Bruce was holding on tight as the 80 pound Tuffline surged off of the reel. Adjusting the drag to slow it down only confirmed that they were messing with a serious fish down there! The rod arched over the side and Bruce’s back was already feeling the strain of what was going to be a long battle! After 15 minutes of give and take, it was time to share the load and Kraig took the rod to give Bruce a break. He was able to get some line up but the fish was still far from the surface. George took his turn and after reeling through the 3-man roster a few times, they finally saw a huge dark shadow begin to appear below the boat. Kraig called the Fishmaster to standby in case they needed assistance. After 90 minutes of a hard fought tug-of-war the massive green-brown head of a giant halibut broke the surface. The first thing they noticed was the precarious state of the big circle hook, looped through the fish’s lip like the boldest piercing. They had no idea how that little strip of skin, perhaps a half inch thick, could hold up against the strain they put on that fishing line! Once they’d seen the fish Kraig called on Shooter to get out there for some photos to capture the event. During the 15 minute wait the halibut began to descend and they decided not to test it too much for fear of breaking it off. With Shooter on the scene with the camera, it took them another 30 minutes of tough pulling to bring it back to the surface. Kraig has a bit of a reputation for catching big “butts” but this fish was extraordinary. The head was absolutely huge and it’s wide open mouth looked like it could swallow a football! It rolled over to its white side and suddenly the enormity of this halibut was plain to see. As he carefully led the giant alongside the 24-foot aluminum boat, he knew that this fish was well beyond the size of any halibut he’d ever seen before. Of course, every fisherman wants to know how big his fish is and these guys were especially curious. How do you describe a catch like this? Fortunately there is a chart published by the International Pacific Halibut Commission (IPHC), formulated from logged commercial halibut catches, that gives us an indication of the weight of a halibut based on it’s length. The obvious challenge… how to measure a barn-door-sized fish, held on the surface by only a little hook through a thin strip of skin? At any moment this fish could easily break off with a twist of its giant body in the water. Amazingly, this particular giant was extremely well behaved. Eventually they were able to get it horizontal alongside the boat and, after inconclusive attempts with the harpoon shaft, and the net handle, they decided to put a line on its tail and hopefully hold it flat. That took some doing but finally they managed to get a rope over the tail, which was 22 inches across! While Bruce held its tail just under the water and Kraig (with fingers crossed) managed the head with the circle hook, George used a salmon rod as a measuring stick. Flexing the rod to follow the curve of the fish, they marked the spot on the rod and then measured with the tape. The number they got was “off the chart” that is stocked in QCL boats so they measured again to double check. 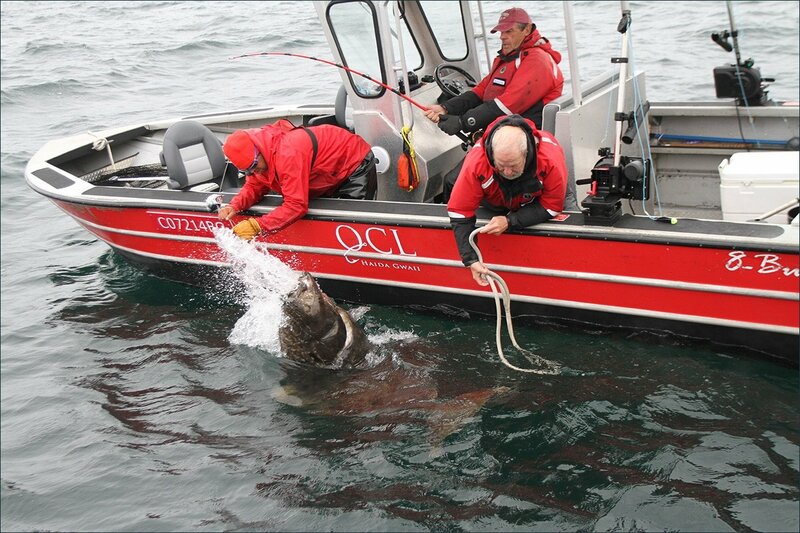 Stretched alongside them was a halibut 90 inches in length! Seven and a half feet! That was a full 10 inches longer than the current lodge record fish, landed just a month earlier. 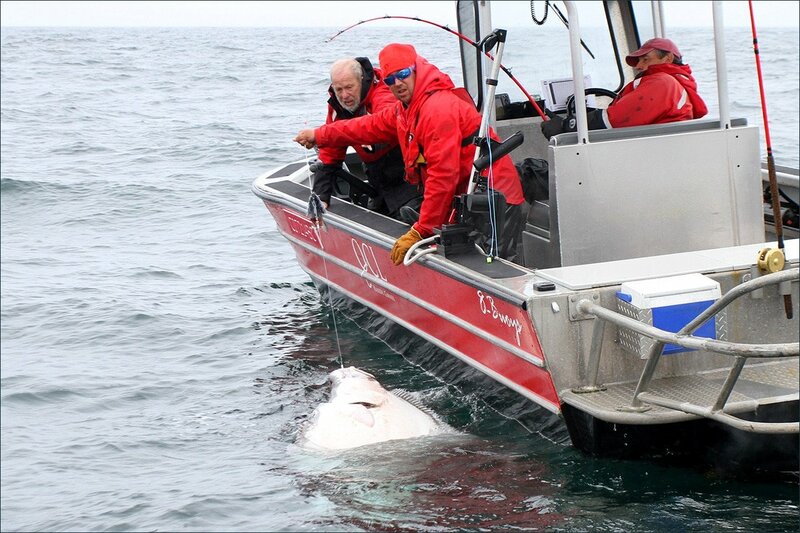 They had no idea what the weight would be but the 80-inch fish was 277 pounds. Not until they arrived back at the lodge would the internet tell them their halibut would weigh approximately 405 pounds! With measurements and photos completed it was time to let this big female return to the depths. She could produce about 4 million eggs when she spawns next winter! 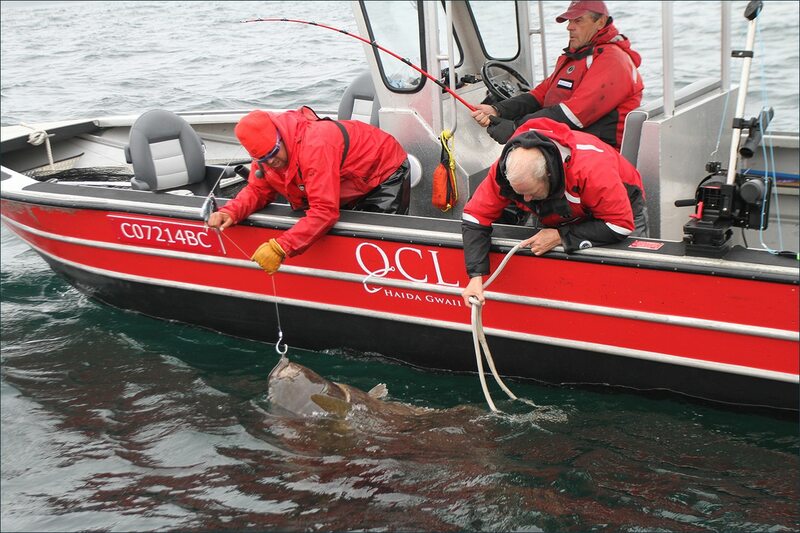 With Bruce on the tail line Kraig easily removed the circle hook from the halibut’s lip. There was a moment of hesitation but once that great head pointed toward the deep there was no stopping this fish! Like a giant spring the fish’s body flexed and Bruce’s grip on the rope let go. The tail slapped the surface like a humpback whale, splashing water everywhere, and the rope briefly followed, singing over the gunwale as this gentle giant made her way towards the bottom. What a fabulous moment to share on the water! The three exhausted anglers sat back and reflected on what they had just experienced. It was the stuff of dreams, a fish they could not have imagined crossing paths with! And yet it was over, the halibut returned to her place down below and the men left with memories and a story to share for the rest of their days. I guess that’s what it is with fishermen. Queen Charlotte has ALWAYS been good to the fisherman in my family. What an awesome story and what a deserving group of men!! My back hurts just reading it. That was my brother Bruce in those pics!!! He was so excited telling us about the catch! Thanks for helping him find the “catch of the day”!!! OMG! !What a fish, I can’t imagine how much fun that was. Good job guys! Great catch Dad!! It’s a good thing there are pictures with this Fish story! Incredible.